Lou Andreas Salomé was married to a professor when she met Rainer Maria Rilke, but having refused to sleep with her husband, she took the young poet as a lover. Salomé had been an intimate friend of Nietzsche’s, and now she encouraged Rilke to see poetry as a way of life, more than a mere literary calling. Together, Salomé and Rilke believed in a grandfatherly god and in man’s ability to turn suffering into art, and they traveled to Russia twice—once in company with Salomé’s husband Carl Andreas. When they parted ways at the end of the second trip, though, Salomé’s nerves were frayed by Rilke’s constant needs. Rilke went off to an artist colony where he married a sculptor, Clara Westhoff, who had been a student of Rodin’s, and by the time he went to Paris to work as Rodin’s assistant—and to write a book about his work—he and Lou had ceased to be in touch, for Salomé had written him a scathing ‘Last Appeal’ when she heard of his marriage. 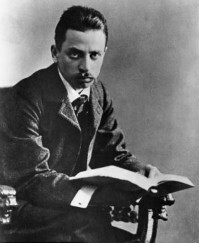 Salomé had spelled out Rilke’s faults to him in her letter, and they did not speak for two years, but by the time they got back in touch, Rilke turned to Salomé for insight into the very difficulties she had accused him of. They returned to each other, and for the next sixteen years, they were occasional lovers and intimate confidants, as Salomé became a friend and follower of Freud’s and brought the fruit of her psychoanalytic training to letters that tried to help Rilke come to terms with the migratory lifestyle and romantic disappointments he endured and turned into art.